Our magnificent custom made 'Grand Märta' Gustavian demilune extending dining table with decorative beaded apron and standing on four elegant square tapered legs with scalloped tops. This classic Swedish dining table can be easily extended by 1, 2, 3, 4 or 5 table leaves using the sliding wooden extension mechanism concealed under the table top, up to a maximum length with all 5 leaves of 395cm (13ft). Shown here with 3 leaves inserted. All our bespoke demilune tables are hand made to order in solid sustainable native Swedish birch. 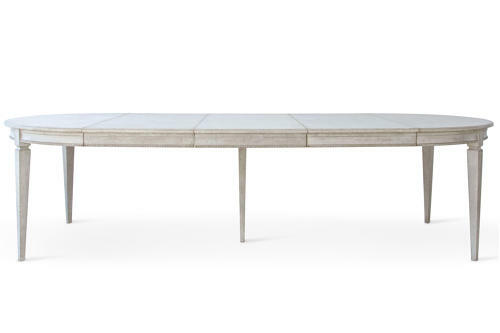 This table can be specified in even longer lengths of up to 460cm (15ft) and diameters up to 140cm (4ft 7in). Please call or email enquiries@georgialacey.co.uk for a custom quote.